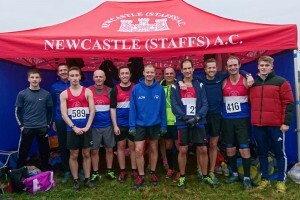 Our U/20, Seniors and Veterans competed in Saturdays Staffordshire Cross Country Championships held at Stafford Common against the top teams from across the county. In the U/20, Seniors and Veteran Women’s race we had 11 racing over the 6.2 km 2 lap course. Our first finisher was Rebecca Twardochleb in 2nd position (and 1st U/20) in 19:43, Sophie Goodfellow was 5th (and 3rd U/20) in 20:54, Amy Neill was 7th (21:08) just pipping U/20 Lucy Matthews into 8th (21:09). 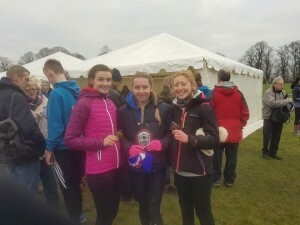 Fellow U/20’s Grace Ranford and Lauren Charlton were 11th (21:29) and 17th respectively. Maxine Bickerton was 31st (24:01), Rachel Wakefield was 41st (25:20), Jan Cassidy was 43rd (25:36), Rachel Trpeski was 55th (27:51) and Cheryl Everard was 59th (28:29). Our Senior Women were convincing Team Champions scoring just 22 points, our U/20 Women also convincingly won their category, scoring just 8 points and filling 5 of the top 6 places, and our Veterans finished in 7th position. In the U/20, Seniors and Veteran Men’s race we had 13 members racing over the 3 lap 10km course. In 12th position (and as 4th U/20) was James Fradley in 30:26, Fellow U/20’s Jordan Nixon and Jacob Droogmans finished in 17th (31:05 and 6th in age group) and 21st (31:28 and 8th in age group) positions respectively. Simon Ford was 25th (31:49 and 2nd Veteran Man), Andy Walker was 44th (33:51), Jerome Stevens was 61st (35:29), Neil Gerrity was 69th (36:27), Craig Taylor was 71st (36:37), Mark Cotton was 84th (38:45), Stuart Cassidy was 89th (39:35), Paul Wakefield was 93rd (39:49), Pab Maddox was 94th (40:09) and Matt Way was 97th (40:43). Both our Senior and Veteran Men finished in 4th position overall, whilst our U/20 Men finished in a fine Second position. Congratulations to all our athletes who represented the club, to our Champions and Medal Winners, and good luck to all those selected to represent the county at this years Inter Counties Cross Country Championships at Loughborough in March.